I am currently working on a new server called the Directors Lounge. Anyone in business knows you can never have enough contacts regardless of what industry they are in as some day they may always come in handy. This will be an extension of the CFL Eco-system. I will release more information on this and the server itself shortly but the idea is while we are all here because of Crypto a lot of us developers, investors and community members alike have other businesses or other streams of work or revenue outside of Crypto and the idea is to start to capitalise on this and bring more people together. More will be disclosed soon but the aim is to not just single this out solely to CFL but to open it up to be an open source area of contact that will have opportunities creating more purchasing of CFL and other coins based on levels of marketing and promoting of expertise and products outside of Crypto! 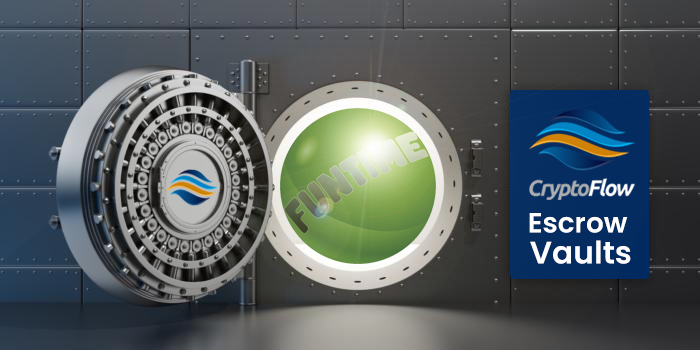 @everyone Firstly: with the up coming Pre-Sale of FunTime Coin https://discord.gg/AAhEEBe I want to tell you the workings and innovation of CryptoFlow Vaults. This will be the general protocol for all other coins also. 1. Pre-Sale will take place on SPP as a first for them also. 2. Once Pre-Sale is over any remaining Premine will be distributed to four wallets. 3. At this point we want to keep somethings confidential but from here coins can only be transferred from these wallets from two passwords been used. One held by CFL and the other with FunTime Dev. 4. CFL will be given a channel on FunTime Coins server. Once the time comes for some premine to be released a public request by the Dev will be made on the channel for all to see so that it corresponds with the time it should be released according to their RoadMap. 5. Due to Financial Law we have it perfectly setup that CFL will not have access to the premine solely and can only be released using both passwords. 6. FunTime have choosen to go for the Silver package due to the nature of their coin and as such payment is €300 for the service. I have requested that instead of giving into the sellers that they place a buy wall instead a few days into their Pre-Sale. At the current rate this will be a 1,000,000+ CFL wall. 7. Once the coins are handed over they will then be burnt! @everyone there is some very exciting news from our Official Shared Masternode Service - Midas.Investments! 🔘 No fees taken in CFL or MIDAS. 🔘 No fees to invest in the CFL Instant Share node. 🔘 No fees to host your node on the Midas platform. Earn 100% of rewards for CFL and all other coins listed to Midas - even without VPS costs! We are excited to become pioneers once again and become the first investment platform to launch zero fee investing alongside the revolutionary new utility for MIDAS - the ‘MIDAS Lock-in’. It is with a heavy heart that I share this with@everyone. Unfortunately, due to personal constraints, I need to take on a lesser role in OWO and CFL projects and will be serving only as a technical advisor. Although I need to refocus my attention and energies on my health, I remain fully committed to both projects and will be in constant contact with the team. While I won't be as present on Discord (as I'm sure most have been keenly aware as of late), I will pop in when possible to catch up with our wonderful community. I'd like to take this opportunity to personally thank @429903437916930068>, who has filled in during my absence. He has been instrumental these past few months, either behind the scenes pushing the team and moving the projects forward, or keeping the community informed and spirits up...Thanks buddy. Today we turn on the protocol enforcement, so from now, old nodes on protocol 70888 become missing and the only protocol allow in the network it's the 71000 with the recent wallet launch some days ago version 1.2.1.0 MAIN with a revision version for 1.2.1.1. This does not effect the running of the platform and I want to stress it is still useable by@everyone, those already verified can continue to take advantage of higher limits, for the remainder, we will be looking into alternative forms of identification. Until then unverified people who to be honest is the vast majority of the customers can still use it as they where to the lower limits set out. We fully intend on pushing forward with CryptoFlow and while there is a lot of focus on the platform this was never intended to be the only part of the business. It will remain active and we will continue building around it with more and more products. Over the next coming weeks we will be expanding on the CryptoFlow Vaults with more details on the workings of it as well as collaborating with some of the Shared Services who offer Pre-Sale through their platforms, in addition we will combine One World in all this as well and provide a one stop shop for people can go to with faith they are getting trusted services. @everyone So over the last few weeks we have been monitoring a couple of addresses and unfortunately it appears that while we thought CFL's chain was running smoothly with no issues for a long time now it appears we were the target of an exploit. The hackers did get coins although we are not sure how many, it could possibly have been going on as far back as the beginning of the year. That combined with some huge dumpers yesterday cashing out for BTC has put us in the unfortunate position we are in now. As per normal we will not be disclosing the source of the exploit as we are very aware hackers love getting this free information so they can use it on other coins. In addition to that we have been having huge issues with IDnow who do the video ident for us. Out of all the hundreds of users we have on the platform only a handful have successfully completed the verification process and as such limiting the use of the platform for many. We have continuously been back and forward with IDnow who I have to say have been less than helpful. They are trying to dismiss any blame on there end but we are not accepting that. As such we will more than likely terminate their contract with us over this. we are going to postpone the ANN updating everyone on things until tomorrow while we investigate it further. @everyone Tomorrow evening we will give a full update on CFL and issues we have been dealing with over the past few weeks. Please note though while I apologise for not been more communicative lately we have been working continuously in the back ground dealing with things and we will continue to be here doing that and doing our best for this project. We have not by any means left or stopped for a second! remember to update your wallet regarding the instructions above. Old wallet and old protocol will not work more after block 330k. Option one - You can use our Update Scrip that automatically will clean the CFL wallet and the block. After that will install the new wallet add the bootstrap for faster sync. Once Masternode VPS on same block just wait some time and then do start alias on your QT wallet, after that come back to VPS wallet and confirm it with the command cryptoflow-cli masternode status. If status 4 , all ok. if not please wait like 1 hour or more to do it again. New updated wallets are ready to download at Cryptoflow GitHub. Old protocol will become invalid . We will give you guys time to proced with the update, when the majority of the nodes on the new protocol we will shutdown the older one. @everyone CB deposits and withdrawals are temporarily disabled due to the wallet update. We will put full details up in the next few moments. @everyone As previously mentioned we have our first customer of the CFL Vaults. Once their Pre-Sale starts fees will be paid. The terms of their Pre-sale BTC and Pre-mine lock down will be uploaded once fully finalised with the developer. FunTime Coin is a community syndicate coin based around the EuroMillions Jackpot where your MN becomes your Golden Ticket every week you hold it. Original idea and looks very interesting and hopefully the addition of using the CFL Vault system will also put their investors at ease and let others see the benefit of it. @everyone We have been listening to you all and as such we have made the decision to cut the reward structure to combat the coin inflation. As of Block 320,000 the current structure from there on will be reduced by approx 60%. This will dramatically reduce the ROI currently to about 100%. There will be a wallet update needed to carry this out as well as some essential updates to the chain. In addition to the above we have now officially opened the CFL Escrow Vaults of which we have attached more information on this below. The fee's for this service are to be paid in CFL and these coins will be burnt in order to help the current market further. We are also glad to announce that we also have our first customer of the Vault program already who will be announced later in the week when they are ready. @everyone We are currently working on a additional service called the CFL Escrow Vaults whereas we will be helping out new coin developers and their investors by taking over the pre-mine of the new projects and releasing it at set times according to the projects roadmaps. We will put up more details shortly but we already have our first customer of which we will also announce once they are ready. From now on we will provide to everyone a bootstrap of CFL chain to faster sync your wallet . Thanks @363031129072074752> for this and the instructions you include for Windows, IOS and Linux . Contribute to CryptoFlowCoin/Bootstrap development by creating an account on GitHub. @everyone Earlier today CHT got hacked effecting a lot of coins, however CFL was not one of them. Please below from their server. We will at this point no longer be recommending CHT as a a shared service and it is at your own choice should you wish to have your CFL coins remain there.